Things are getting a l'il crazy around here...begging such questions as...where is spring? Why is there snow on the ground in late March? Why is it 28 degrees? Is anyone holding that groundhog accountable for the blatant lies he told us about an early spring? And finally, where are all my spoons? I know, it's just bizarre - my spoons are disappearing on a daily basis. I'm down to like four. I have 2 feasible theories on this - 1) They're disappearing into a vortex - a black hole of sorts - where everything you've ever dropped and haven't been able to locate winds up. You know what I mean....you drop your earring while trying to put it on in a hurry, and that thing vanishes. You swear it HAS to be on the floor somewhere. You saw it bounce. How far could it have possibly gone? You're on the floor, peering under the couch, feeling around the floor desperately, where the hell is it? Finally, you resign to leave it for later, figuring it'll turn up at some point. It never does. This type of thing happens a few times and you realize there's obviously a vortex located in your living room. You think back to all the things that have gone missing over the years....earrings, keychains, perhaps even a cell phone...and it all starts to make sense. Where does this vortex lead to? Is it simply a stationary black whole where things disappear never to resurface in the physical world again? Or does it lead somewhere - to a larger "storage area", if you will, where your stuff is deposited along with everyone else's lost stuff from their own living room vortex? Or does it lead to some other random spot, here in the world, much like the movie "Being John Malkovich" where people are deposited on the side of the New Jersey Turnpike? Is that where your missing earring is? Somewhere on the New Jersey Turnpike - or the Long Island Expressway, for that matter? In any event - my spoons may or may not be a victim of this black hole phenomenon, but if so, it begs the questions - why the spoons? Why not the forks or better yet the butter knives? Which leads me to theory # 2) The kids are throwing their spoons away after their morning cereal by mistake. After all, they use the spoons more than anyone else in this house does. I'm personally not a big "spoon person", in fact I much prefer a fork - although that gets a little tricky when it comes to soup. I suppose it doesn't really matter. In any case, my spoon stash is dwindling quickly, and it's frigid outside. 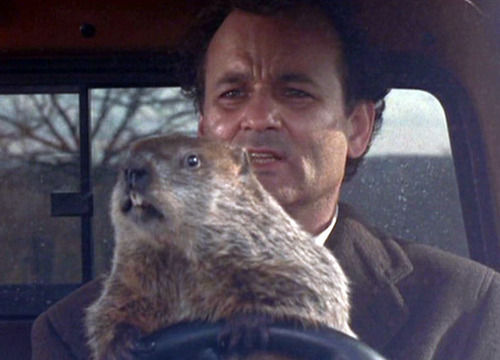 Obviously the regular rules of humanity don't apply to Punxsutawney Phil. Groundhogs are clearly exempt from the social norms of our society where we're expected to be truthful, honest & forthcoming. I'm guessing he could be running a meth lab out of his treehouse and authorities would look the other way. For all we know, the collective vortex's in all of our living rooms somehow leads straight to Punxsutawney Phil's Pennsylvania lair. He probably has all my spoons. Happy Friday, All!